WHAT AGE DOG SHOULD WE GET ? PUPPY, JUVENILE, ADULT, SENIOR ? In this chapter I will try to explain the differences you can expect to find between the different stages in a dogs life, things that might impact on your choice of new dog sometime in the future. Things like a dogs behaviour, physical and mental well being, ability to learn, ability to put up with things, what they require from you for a good life, and many other things do change as a dog progresses through life. I think it best to start at the beginning so we will start by looking at a puppy. Make no bones about it a puppy is hard work. For those of you who have had a dog before from a puppy you will know and most probably forgotten how much hard work they are. If you are seriously houseproud then a pup is probably not for you. These opening lines are not meant to put anyone off from taking on a puppy but simply to tell you honestly of the hard but very rewarding work ahead to end up with the dog you would love to have. One obvious benefit of taking on a pup is that to a certain extent you have a clean slate to work with and you can help him or her become the dog that you want, this though does depend on things that I mentioned earlier and later about getting them from a good home, with good parentage, for this will already be having an effect on your pups present and future behaviour; a large effect actually. If you (and you should) get your pup from a good home (see the /where-do-i-get-my-dog-from topic), then by the time you pick up your pup he should have learnt a lot already from his mum, his litter mates, his first owner or breeder and his/her environment that all this happened in. Your pup by 8 weeks should have learnt bite inhibition (knowing not to bite too hard), how to take discipline (from mum and other litter mates), learnt submissive postures and other postures, also experienced playing, barking , fighting, just being a dog, all with his or her litter mates and mum. Hopefully your pup has been exposed to some novel stimulus like household noises, new people, trips in a car preferably with another litter mate not on their own, introductions to a friendly cat etc (all so he is not scared of his own shadow), it would be good if the pup had also experienced doing some of these things on different surfaces like concrete, wood, carpet, grass and others as this helps them deal with all new novel things (like snow for instance) in the future. I would like to add here that all these things (which you must carry on doing after taking your pup home) should be carried out without scaring your pup otherwise you might give him/her a lifelong fear of whatever scared them. Puppies go through a FEAR PERIOD between weeks 8-11, if something they see as traumatic happens at this time it imprints on them more than at any other time and your pup can develop a lifelong fear or phobia. A physical or physiological trauma (in their eyes) at this time can easily lead to avoidance response, (there is another longer fear period for juveniles between 6-14 months). If possible do not have any unimportant treatments or surgeries carried out in fear periods. An obvious problem here is that pups are taken from mum and litter mates during this fear period time and so this has to be handled well as it will obviously be a traumatic time for any pup, some pups for instance will develop a fear of going in the car after this as they associate going in the car to your home with being separated from mum and litter mates (makes sense really doesn’t it), simple things can be done though to decrease the chance of this happening (which I cover later in the /collecting-a-new-puppy-dog section). Another thing to be wary of at this time is trips to the vet, for inoculations for example, make the trip as jolly as possible so his/her first associations with the vets is not a bad one as it might lead to a lifelong fear of the vets otherwise, (see the /taking-your-dog-to-the-vets section). The following is a case I came across while working as a canine behaviourist and shows the consequence of a bad start in life for a dog, sadly this story is repeated all too often in different ways. A collie was acquired by a couple from a farm, the pup was kept in a barn, kenneled and not with mum or litter mates. Collies have a genetic predisposition to nervousness and because of his lack of a stimulating, neutering environment this poor chap was hyper nervous when I saw him at just 10 weeks. He had no experience of any novel stimulus what so ever and was scared of everything he came across in his new home environment. He had no socialisation with other dogs or people and so was scared of both. He was nipping the new owners quite hard as there was no bite inhibition learnt from playing with mum and litter mates. He would only eat his food on the patio outside as he had only ever been fed before on the concrete on which his kennel stood and so had become imprinted with this surface as the only one to eat off. House training was proving difficult as he had previously had to defecate where he slept in his kennel, something most dogs will not naturally want to do but if kenneled have no choice. He was showing avoidance responses to many things as he was scared to approach them (usually just hiding all the time); when put under minimal pressure he showed signs of nervous aggression. Most of the above were eventually put right with lots of time, effort and commitment from the new owners to over come the bad start he had in life. So as you can see the first few weeks and months of a pups life are very important and you will need to carry on the hopefully good work that the breeder should have put in when you pick your pup up at 8 weeks or so. I say or so but it should not really be earlier than 8 weeks otherwise your pup will miss out on vital extra learning from mum and litter mates, a week later (9 weeks) would be OK and maybe beneficial in learning terms but go beyond this and your pup is losing out on the other experiences and learning that you can provide and he or she will be making his or hers own mind up about things making it harder for you to put the rules in place when you do eventually get them. As a behaviourist I have personally seen dogs similar to the earlier collie pup that owners took on at say 12-14 weeks, at this age they have passed much of the critical period of early learning, have had little or no early learning and experiences, sometimes been kept in not very neutering environments and from day one the new owners are struggling to control things and make headway. A pup like this needs an experienced owner. See the "/picking-the-right-puppy-for-me" topic. THE FIRST THREE TO FOUR MONTHS OF A PUPS LIFE ARE A CRITICAL LEARNING PERIOD AND WILL AFFECT THE ADULT DOG THEY BECOME ! The juvenile dog period really runs from week ten on to the time of adult full social maturity, this is generally at about two years but this varies a lot from breed to breed with the much larger breeds like mastiffs and mountain dogs for example taking three years or more and some smaller breeds taking much less. This adult social maturity is also influenced by the amount of actual socialisation that a dog truly experiences as he develops. Sexual maturity in a dog is much earlier, around 8-12 months, for males and females, but true adult status comes with social maturity. The juvenile dog goes through a second fear period between 6-14 months and care must be taken not to seriously traumatise (in their eyes) the dog for fear of development of a lifelong fear/phobia. The juvenile period like the puppy period is also a vital learning period, especially the first few weeks and months and socialisation with other dogs and exposure to non scary new stimulus should be top of the list to help you end up with a sound, well rounded sociable dog. In my experience if there is a juvenile dog looking for a new home then he or she generally has often already had a home and for whatever reason this has not worked out so as a new or inexperienced perspective owner you have to be just a little bit careful. If possible try to find out the dogs history and why he or she is available at this age. If you are an experienced dog owner and the dog has no obvious behavioural problems then all should be well. If the juvenile dog is still with the breeder at this late time then ask why he/she has not been homed before, look at the environment the dog is in, if he/she is older and has had no or very little socialisation or experiences then beware unless you know dogs well. This may sound a little harsh but I have come across many people who took on such dogs and were unable to cope; even experienced dog owners. As a dog gets older any problems he/she might have had from an early age become harder to remedy and require more time, effort and consistency to sort out. 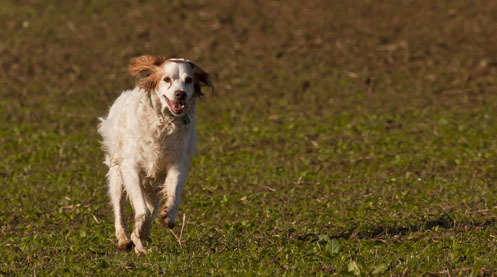 There are not many dogs out there that don't have some small behaviours that their owners might not like but will put up with for the great enjoyment that they get in return. We don't want to end up in a situation where such behaviours outweigh the good things about having a dog in your life. With a juvenile dog the most important things to look at is general temperament, sociability with dogs and people, reaction to novel stimulus (don’t run away or attack), house training (is it already or partly, if not might be an issue), behaviour around its food and toys (can you approach no problem), behaviour around children (if you have them), behaviour with other animals like cats (could be big problem if not ), and if you already have other dogs - how do they get on. Early in the juvenile stage dogs are still quite pliable in their behaviours and open to modification but this reduces as they get older, any undesirable behaviours become more entrenched as the synaptic pathways in the brain become deeper. The longer the dog has an undesirable behaviour the harder it is to change it, so the older the juvenile dog you are looking at the harder it will be to sort out any problems if they exist. Without a doubt there are many lovely juvenile dogs out there looking for a good home you just have to be a bit careful with your choices. If you decide to take on a juvenile dog then try and take him or her out for proper walks before making a decision: see what they are like around other dogs if possible, how they act as strangers approach, how they react to some minor discipline. Watch what their general demeanor (body language) is like, are they moving confidently with you or hunched, tail tucked, worried, anxious etc. Can you play with them and take toys, balls etc of them easily. If you have other dogs get them together in a neutral environment before you take them home, if things go badly it will probably be worse in your home. If you are not happy then look elsewhere for you may well have fifteen years with your new best friend. Of course if you know dogs well then small problems can be overcome and a lovely dog is probably waiting within, but a first time dog owner should tread a little more carefully. There are without a doubt many lovely juvenile dogs out there just make the effort to find one that’s good for you, your family, your experience and your lifestyle. The adult dog is like it says an adult. He or she will be well set in their ways though still puppy like in others, this is a result of their at least 10,000 years of domestication with us, and explained in behavioural context by the phrase Neotony. Neotony is the maintenance of juvenile characteristics into adulthood (an adult dog with juvenile ways), some examples would be playfulness, seeking physical contact and attention barking. An adult dogs behaviour will be well set and any behavioural problems, should they exist, will be well entrenched and much harder to change. So, if you are looking at an adult dog then you really need to be well aware of his or hers temperament, sociability (with dogs and people), reactivity (to things they come across in the environment), how he or she behaves around food/toys etc ( guarding ? ), how they behave generally on a walk. When out walking them look for a relaxed body posture, not permanently head down tail tucked (scared, anxious,nervous) or permanently tail erect with stiff upright body (dominant, anxious, stressed), on their own these postures might not be a problem but they might lead to problems of various sorts if you are inexperienced and handle things wrongly; especially in a previously not well socialised dog. Hopefully problems will soon show on a walk before you finally take them on and you can decide if you can deal with it. Often with older dogs that have undesirable behaviours already in place it is a case of prevention and management rather than cure; a good behaviourist would be required. It would be advisable if possible to take the dog out for a few walks before making a decision so it knows you a bit and reacts more naturally around you and you can see what they are really like and not being influenced by a first walk with strangers. You would probably put some effort in finding a new car and this is so much more important than that. Again there are undoubtedly many lovely adult dogs out there that will make a great pet and with some initial time and effort you should find one. Don't be afraid to question the owners of a dog you are interested in as much as possible for you will hopefully have many years to go with them. See the "/picking-the-right-adult-dog-for-me" topic. The senior dog would probably be a dog of 6-7 years and older depending on breed with the larger breeds slowing down earlier and not living so long. Some of the giant breeds may only live for six or seven years and the small breeds like Jack russells up to twenty years, something maybe to bear in mind if you are yourself an elderly person. Like the adult dog the senior dog will be well set in their ways, more so than younger dogs and again any undesirable behaviour present will be much harder to change. The longer the dog has a certain behaviour the deeper the synaptic pathways in the brain become and the harder it is to interrupt this pathway and divert it to a more favourable outcome. At a young age the pathways are like a little path through the brain but in a senior dog if not dealt with over the years they become a motorway. So, when you look at a senior dog what you see is probably what you will always have unless you seek professional help and have lots of time and willingness to change things. You can teach an old dog new tricks but it is not so easy. Often with older dogs that have behavioural issues it is a case of prevention or management is better than cure, you would have to learn the signs for what precedes or causes any undesirable behaviour and either avoid it or divert your dog. Another thing to think of is that just like people, old age for dogs can bring physical and mental problems that you might have to deal with, which could be costly and many insurance companies will not insure new dogs over a certain age. There are things that can be done to help older dogs with these sort of problems, like cognitive dysfunction, and as their owner you are duty bound to visit a vet to help them have a better life. Many senior dogs are happy with their lot, they can be well socialised and have an easy going, laid back temperament from years of learning, so without a doubt the right older dog can be a great dog too. Again, like the juvenile and adult dogs try to spend some real time with the dog and yourselves out in the big bad world before making a decision, get a proper feel for things. A dog at any age can be a truly lovely thing to have in your life. When young they need to be taught what is acceptable and what is not, they need good ongoing socialisation with other dogs and people, dogs need this throughout life but more so when young. New adult dogs might push the boundaries with you at first to see what they can get away with, but so will puppies. Senior dogs will be well set in their ways. At all times be fair, firm, consistent and loving (all the family). There are lovely dogs out there of all ages just take the time and effort to find the right one for you, your family, your experience and your lifestyle. For further relevent information have a look at my /is-a-dog-for-me-us page.